Congenital anomalies of the aortic arch complex can present diagnostic challenges. Understanding the embryogenesis of these malformations is often even more difficult. 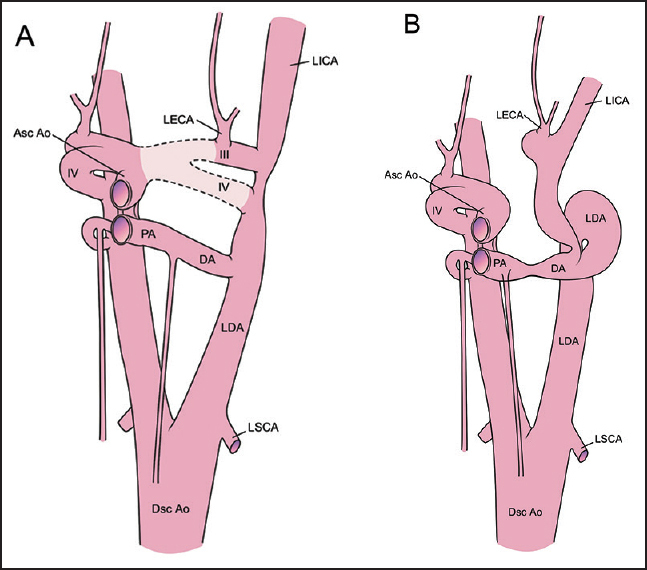 We present an unusual case of what has been called anomalous origin of the left innominate (brachiocephalic) artery from the descending aorta in the right aortic arch and suggest that the name does not accurately reflect the anatomy. A neonate was referred for evaluation of a suspected aortic arch anomaly. A prenatal ultrasound at 21 weeks of gestation identified a right aortic arch. An echocardiogram performed soon after birth suggested a double aortic arch. The infant girl was asymptomatic without stridor, other respiratory symptoms, or feeding difficulties. A repeat echocardiogram confirmed the right aortic arch and right descending aorta. The first branch was the right common carotid artery followed by the right subclavian artery. A large diverticulum passed leftward from the descending aorta and was not visible as it passed behind the tracheal air shadow. From the left chest, a large, tortuous vessel was seen emerging from behind the trachea, giving rise to the left subclavian artery, the left common carotid artery, and finally the left ductus arteriosus. Because of the tortuosity and unusual appearance of the anomalous vessel, a computed tomography (CT) scan was performed. The three-dimensional (3D) reconstruction of the CT scan [Figure 1] confirmed the anatomy as described above and showed that the vascular ring created by this anatomy was quite loose and not causing tracheal compression. No intervention was undertaken and the infant continues to do well with normal growth and no symptoms at 8 months of age. We propose a simpler explanation. The subclavian artery needs no special explanation since it derives from the 7th segmental branch of the dorsal aorta. Similarly, the ductus arteriosus normally connects the pulmonary artery (aortic sac derivative) with the dorsal aorta. Further, the internal carotid artery derives from the continuation of the dorsal aorta cranial to the insertion of the 3rd aortic arch. Persistence of the carotid duct maintains continuity of the cranial and caudal portions of the left dorsal aorta. The external carotid artery is said to form by fusion of the proximal residua of the 1st and 2nd aortic arch arteries and is sometimes called the anterior pharyngeal artery., It ramifies from the cranial end of the horn of the aortic sac at the base of the 3rd aortic arch and eventually migrates onto the 3rd arch. At this stage, involution of the left horn of the aortic sac, along with dissolution or failure of formation of the left 4th aortic arch, would leave the left 3rd aortic arch, carrying the left external carotid artery in connection with the dorsal aorta but freed from connection with the aortic sac. This explanation fits the anatomy shown in [Figure 1] and [Figure 2]. We have recently realized that the left 3rd aortic arch appears to be absent in two of our previously reported cases (Case 2)., In both cases, the left carotid bifurcation but not the right is very low [Figure 3], as has been reported in homeobox A3 (Hoxa3) mutant mice in which the 3rd aortic arch does not form. As in our human cases, the external carotid arteries are present and connected to the internal carotid arteries in Hoxa3 mutant mice despite absence of the 3rd aortic arch. Consequently, at least some cases of this anomaly could be explained by the failure of formation or involution of the entire left aortic part of the aortic sac — the left horn of the aortic sac, left 4th aortic arch, and left 3rd aortic arch; only the left-sided pulmonary components (left 6th aortic arch and left pulmonary artery) being present. What is left unexplained is the looping, tortuous course of the left dorsal aorta in this case. This was present in neither of our previous cases , nor in other reports, suggesting that tortuosity is peculiar to this case rather than intrinsic to the underlying pathology. A potential explanation is marked growth of the segment of the dorsal aorta between the origin of the left subclavian artery (7th segmental artery) and the left common carotid artery or even the left carotid bifurcation. Normally, cell proliferation in this segment of the dorsal aorta is minimal and likely explains the paucity of longitudinal growth that results in the apparent migration of the left subclavian artery toward the left common carotid artery. This segment of dorsal aorta remains nearly constant in length during later embryogenesis while the descending aorta distal to the left subclavian artery elongates significantly. In the previous cases,,, the proximity of the left subclavian and common carotid arteries suggests a normal growth pattern of the left dorsal aorta, that is essentially no growth. 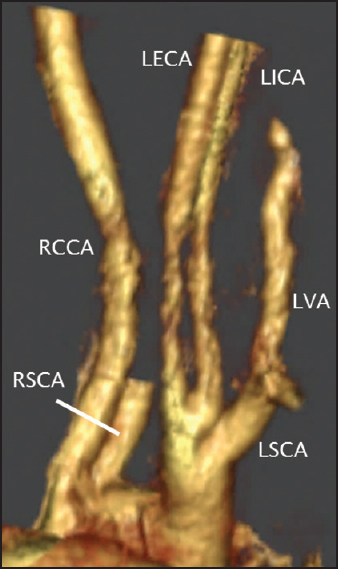 In contrast, the wide separation of the left subclavian and common carotid arteries in the current case as well as the tortuosity of the vessel suggest marked longitudinal growth of this segment of the dorsal aorta. In fact, this excessive growth could also explain the nearly normal height of the carotid bifurcation in the absence of a left 3rd aortic arch. We suggest that there is no left innominate artery present in this anomaly. Instead, the left dorsal aorta is the source of the left common and internal carotid arteries. The left 3rd aortic arch appears to be absent in at least some cases but could be the source of the proximal external carotid artery in others. Even in cases with the carotid bifurcation at the usual location, the left 3rd aortic arch does not seem likely to be the source of the common carotid artery. Perhaps a more accurate name for this anomaly would be right aortic arch with left common carotid and subclavian arteries from the left dorsal aorta. Of note, this mechanism also explains the origin of what is called isolation of the left innominate artery in right aortic arch. One has only to include involution of the left dorsal aorta between the left 7th segmental artery (future left subclavian artery) and the descending aorta, as usually occurs in formation of a right aortic arch. Barcudi S, Sanders SP, Di Donato RM, de Zorzi A, Iacobelli R, Amodeo A, et al. Aberrant left innominate artery from the left descending aorta in right aortic arch: Echocardiographic diagnosis. J Am Soc Echocardiogr 2010;23:221.e5-7. Banka P, Geva T, Powell AJ, Geggel R, Lahiri T, Valente AM. Images in cardiovascular medicine. Right aortic arch with aberrant left innominate artery: A rare vascular ring. Circulation 2009;120:264-5. Weinberg PM. Aortic arch anomalies. In: Allen HD, Clark EB, Gutegesell HP, Driscoll DJ, editors. Moss and Adams' Heart disease in infants, children, and adolescents including the fetus and young adult. Philadelphia: Lippencott Williams & Wilkins; 2001. p. 719. Moes CA. Freedom RM. Rare types of aortic arch anomalies. Pediatr Cardiol 1993;14:93-101. Padget DH. The development of the cranial arteries in the human embryo. Contrib Embryol 1948;32:205-61. Hiruma T, Nakajima Y, Nakamura H. Development of pharyngeal arch arteries in early mouse embryo. J Anat 2002;201:15-29. Kameda Y. Hoxa3 and signaling molecules involved in aortic arch patterning and remodeling. Cell Tissue Res 2009;336:165-78. Rana MS, Sizarov A, Christoffels VM, Moorman AF. 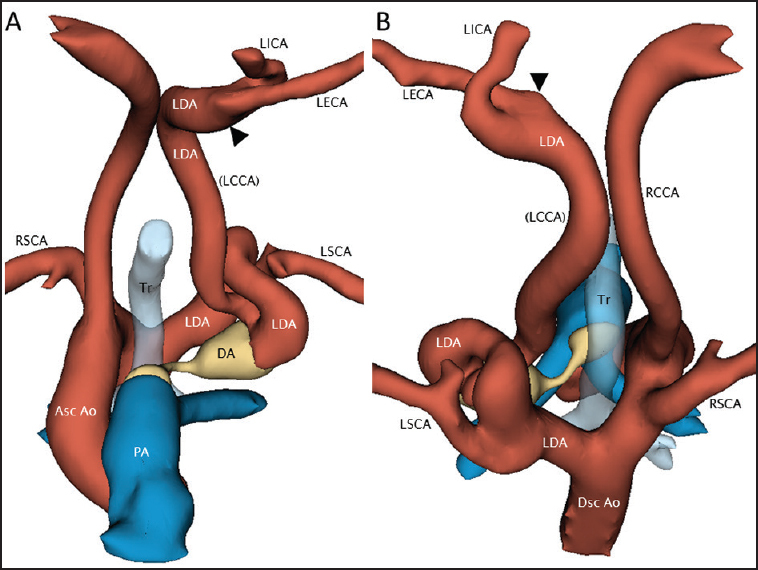 Development of the human aortic arch system captured in an interactive three-dimensional reference model. Am J Med Genet A 2014;164A:1372-83.